Is anyone actually getting public service loan forgiveness? The Public Service Loan Forgiveness Program turned 10 last year. So far, about 7,500 people have applied to have their student loans discharged, but fewer than 1,000 are expected to qualify this year, the Department of Education has told CNNMoney. The forgiveness program was created in 2007 under President George W. Bush. Borrowers who work for the government or a non-profit can apply to have their remaining debt wiped away after making 10 years of payments. It was meant to encourage people with student debt to remain in lower-paying jobs that serve the public -- like public defenders, social workers, and Peace Corps workers. October of 2017 was the first time anyone could have made enough monthly payments to qualify for debt forgiveness. About 7,500 people had applied for forgiveness as of January 5. But the Department of Education was "unable" to say whether any had been approved or rejected to date, a spokeswoman said in an email. If just 1,000 are deemed eligible over the first year as the department expects, that would represent about 13% of those who have applied. The low number is partly due to the limited pool of borrowers who were eligible for the program when it first launched, according to the Department of Education. Dozens of borrowers have told CNNMoney they believed they were making qualified payments when they weren't -- blaming their loan servicers for providing them with misinformation. Some say they planned their careers around the program, only to learn years later that their loan payments did not qualify. To qualify, a borrower must have a federal loan from the William D. Ford Direct Loan Program, as well as be enrolled in an income-based repayment plan. But in 2007, an estimated 25% of the total federal loan portfolio consisted of Direct loans, the spokeswoman said. Most borrowers at that time had loans from the Federal Family Education Loan (FFEL) program. There were also fewer qualifying repayment plans at that time. Since then, the government has ended making new loans from the FFEL program and most borrowers have Direct loans instead. Borrowers with older FFEL loans aren't completely out of luck. They can ask their loan servicer to consolidate their loans into a Direct loan, making them eligible for the Public Service Loan Forgiveness program. The catch, though, is that no previous payments will count toward the 10 years of payments needed before debt is canceled. While the Direct program was available at the time the forgiveness program began, the consolidation process could delay some borrowers from taking advantage of it right away. People have also reported experiencing delays with loan servicers while they certify their income each year for the purpose of remaining in an income-based repayment program, the Consumer Financial Protection Bureau has said. A handful of borrowers have filed lawsuits against their loan servicers over the matter. Amanda Lawson-Ross, a counselor at the University of Florida, believed she had made four years of qualifying payments when a service representative told her otherwise. Now, she has to consolidate her loans into the Direct program and start all over. Part of the problem is that there was no formal process in place for borrowers to find out if they qualified when the program launched in 2007 -- leaving them to rely on what their servicer told them. An employer certification form was eventually made available in 2012, but borrowers are not required to submit it prior to making all the payments. Currently, the Department of Education recommends that those who want to take advantage of the forgiveness program submit the employer form as soon as they can. It will confirm whether they have the right type of loan and if their employer qualifies. As of January 5, about 800,000 borrowers had submitted at least one employer certification form. Once someone makes all 10 years' worth of payments, they then must submit an application for forgiveness. The Trump administration has proposed ending the Public Service Loan Forgiveness program for new borrowers. The Congressional Budget Office has estimated that ending the program would save the government $24 billion over the next decade. 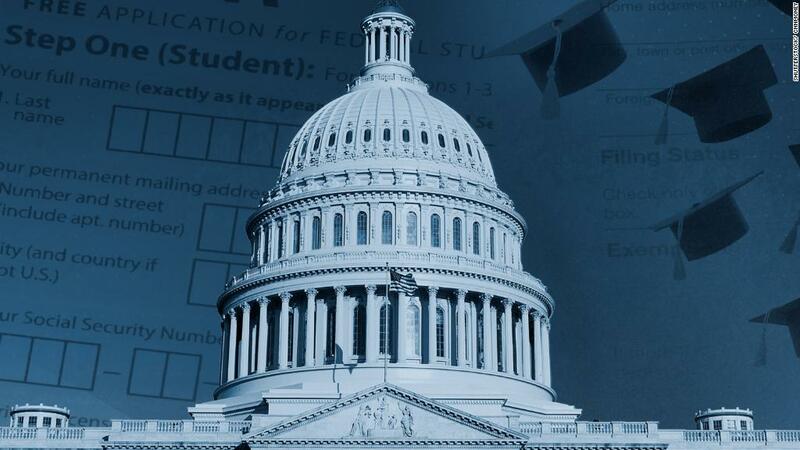 Eliminating the program would require an act of Congress, which is currently considering a rewrite of the federal law that oversees higher education. A House version of the bill would end the program for new borrowers. A Senate version is expected to be introduced this spring. Have you received forgiveness from the public service program? Share your story by emailing Katie.Lobosco@cnn.com.